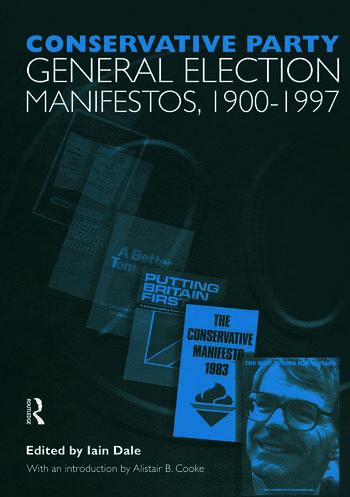 This volume brings together for the first time the British Conservative Political Party General Election Manifestos, dating back to 1900, and including the most recent General Election manifesto of 1997. The volume has a new introduction written by Alistair B. Cooke, who was Deputy Director of the Conservative Research Department from 1985 to 1997, and the Director of the Conservative Political Centre from 1988 to 1997. During that time he edited some 300 pamphlets for the Conservative Party, along with 6 volumes of its comprehensive record policy, the Campaign Guide and collections of Margaret Thatcher and John Major's speeches. He is also the editor of The Conservative Party: Seven Historical Studies, 1680 to the 1990s. In addition to the new introduction, the volume will include a comprehensive index, making it easy to use. Alistair B. Cooke was Deputy Director of the Conservative Research Department from 1985 to 1997, and the Director of the Conservative Political Centre from 1988 to 1997. During that time he edited some 300 pamphlets for the Conservative Party, along with 6 volumes of its comprehensive record of policy, the Campaign Guide and collections of Margaret Thatcher and John Major's speeches. He is also the editor of The Conservative Party: Seven Historical Studies, 1680 to the 1990s.